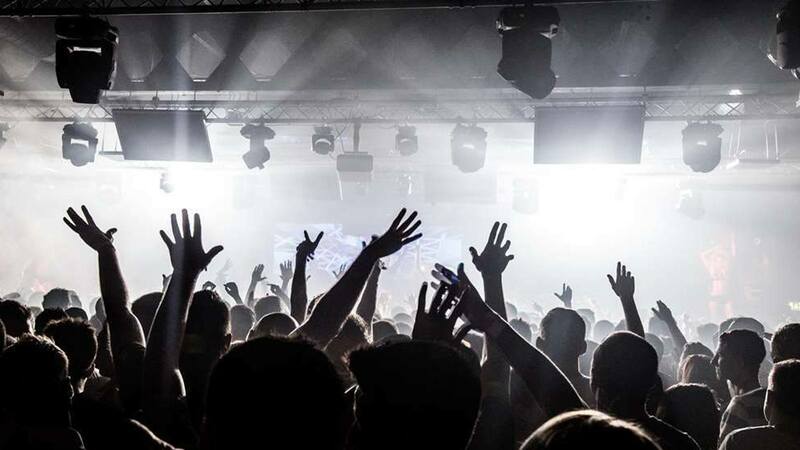 Whether it is a day set up and you need a spare set of technical hands, or a tour that is interstate and need a team of operators and stage crew, talk to us. 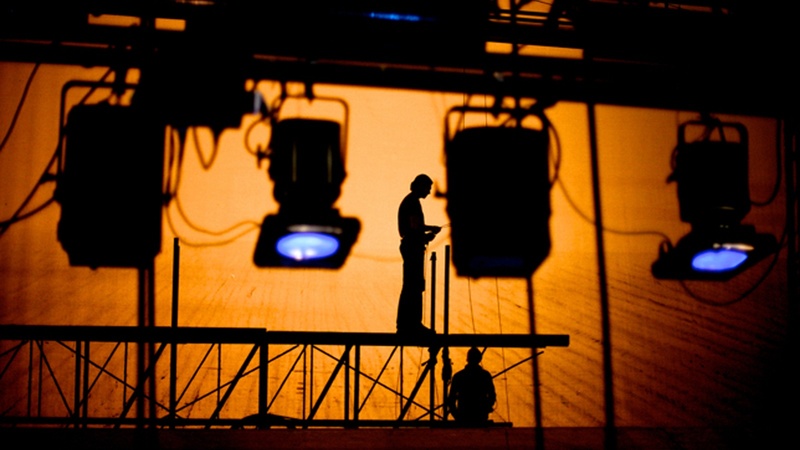 After Dark Theatre has a database of technicians and stage crew personnel for any theatrical job. If you need a stage manager calling your event, or a lighting operator, then look no further. Within our skills network, we have adept lighting, sound, stage management, audio visual, wardrobe, make-up and general crew. I have a festival site and want stage crew. We can aid in the initial preparation phase, organising crewing and managing your roster so you do not need to worry about crew penalties and personnel again. 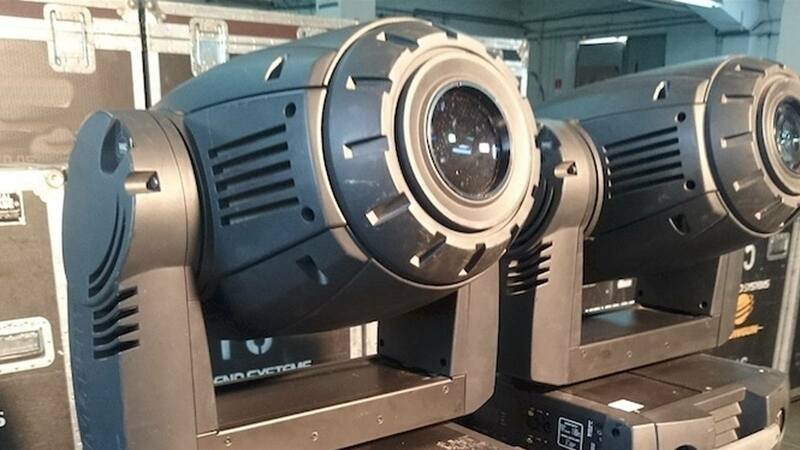 Lighting equipment hire for theatrical productions and corporate events. Also available for long term hires for clubs, bars, venues and community spaces. We have a large range of lighting fixtures available for hire. We offer solutions for one day events, theatrical seasons, festival events and long term semi- permanent installation. Our team maintains and services our gear regularly, so you don't have to worry about gear failing on a gig. 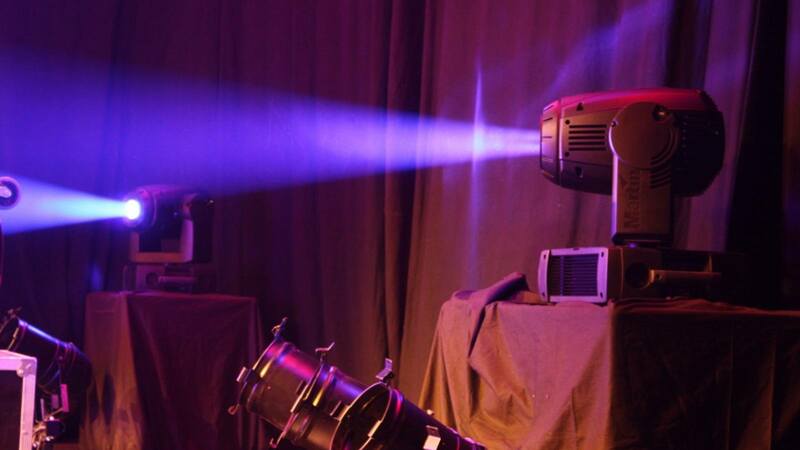 We also offer a range of atmospheric fixtures, including haze, smoke and special FX fixtures. No job is too big or too small, After Dark Theatre has the right fixture for you. Please contact us to enquire about our gear list. Are you another lighting hire company? We offer White-Labelling solutions for you. If you are a small hire company or a large company that needs those few extra fixtures, then sub-hire from us. We offer fully serviced fixtures and no label road cases so you can white-label our gear as your gear. We have a range of products from leading and reputable lighting companies such as Martin, Robe, Jands and LSC. Ground to Air acts are performances or acrobatics that usually involve either a solo artist launching a prop into the air or a group of artists throwing another performer into the air. These acts are similar to ground acts but may require rigging, a higher roof height or larger space to perform in. These acts are true show stoppers and work as a climax to your event before you open the dance floor or start your charity auction. Ground to air acrobatics and how to use them? These kind of acts include Chinese Pole, Foot Juggling, Icarian Games, Russian Bar, Trio Acrobatics, Toss the Girl and Teeterboard. These artists can be your major number, your show-stopper or the act before your major reveal. 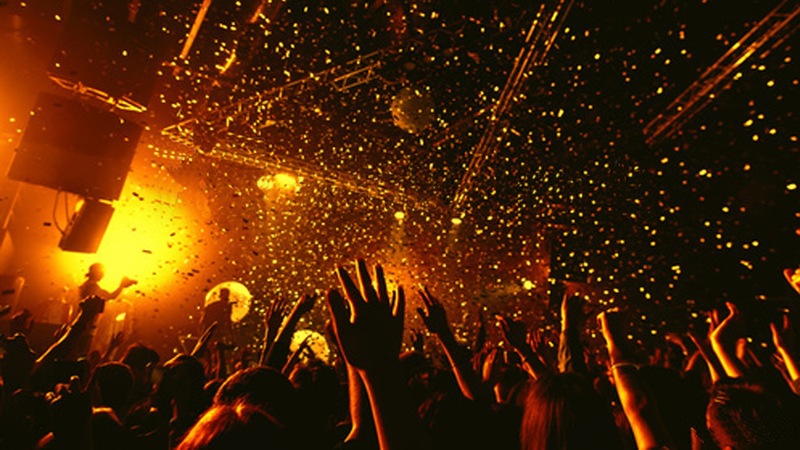 Due to the high number of artists that are normally required for these numbers, you can potentially package these types of acts with other ground acts, aerials or roving entertainment. Is there substantial height in my venue? What is the stage width and length? Try to get as much of the above information as possible so we can see how possible it is to supply these types of acts to you. If you prefer, you can put us in contact with your venue or theatre and we can do all the work for you. 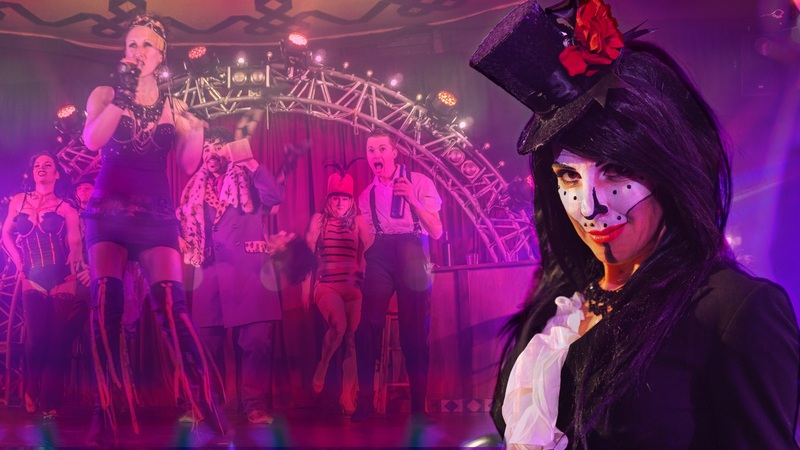 If you are interested in having some of our circus and variety artists at your next event or function, or want to talk to one of our event specialists, contact us to get a quote. An aerialist for your next event, production or function. 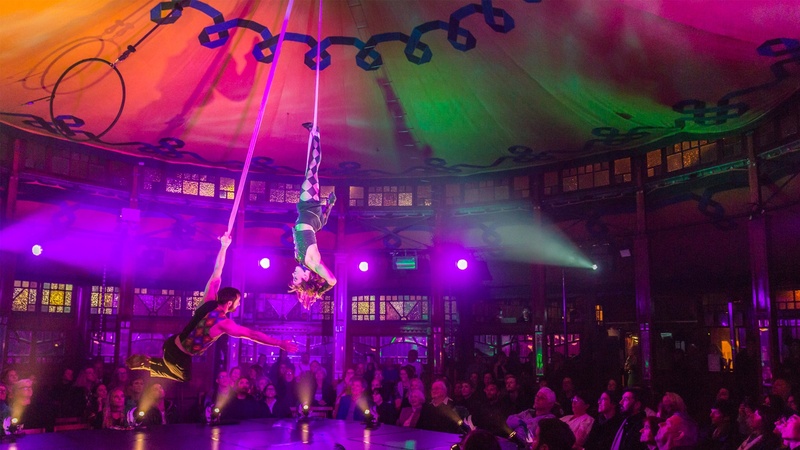 From a flying trapeze, to a sultry aerial hoop act. Aerial acts are performances where the artist is suspended above the stage or your audience. These types of acts usually require rigging and a qualified rigger to perform the act. This style of performance will add a whole new dimension and unique touch to your or event. Types of aerial acts and when to use them. These kind of acts include Aerial Silks, Rope Acts, Trapeze, Aerial Hoop or Lyra, swinging pole, Cloud swing, Tightwire and Spanish Web. These artists are suited to be the big moment for your event as featured entertainment. 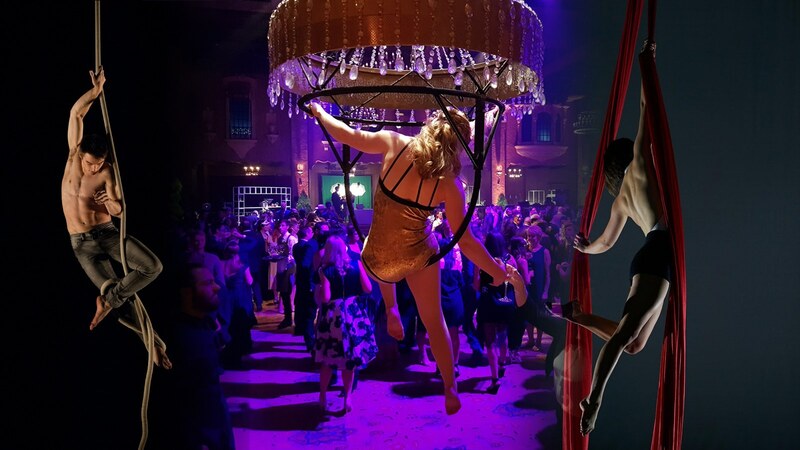 We have also recently created a new category of aerial roving entertainment, as a creative way to have 'eye-candy' in the room; artists sitting on trapeze or an aerialist pouring champagne for your patrons while suspended in the air from the air. Swinging trapeze, flying trapeze, static trapeze, single point... is it all the same and can it go into my venue? This is where a few people can get mixed up with rigging requirements. Some versions of the same act may require stronger rigging loads than others. Some acts require a safe working point load of 500kg, where some may require an entire rig set up and multiple points of rigging to hold up the artist and apparatus. This is something that we can talk to you about with our rigging partners to see if these acts are able to be performed in your venue. if not, consider looking at our high impact Ground acts or Ground to Air act for that wow factor to your event. Ground acts are usually low requirement circus acts that are based on the floor. 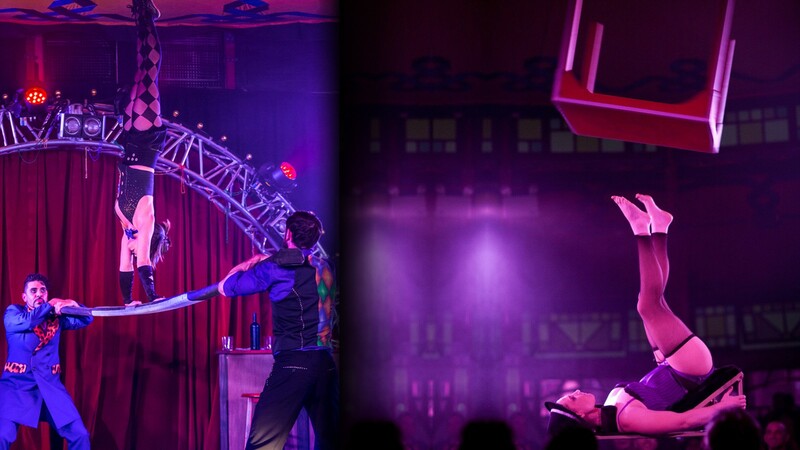 Only needing a small amount of space, these acts can be a great way to add a little Carnivale flair to your event. They are easily adaptable to cater for any function or event. 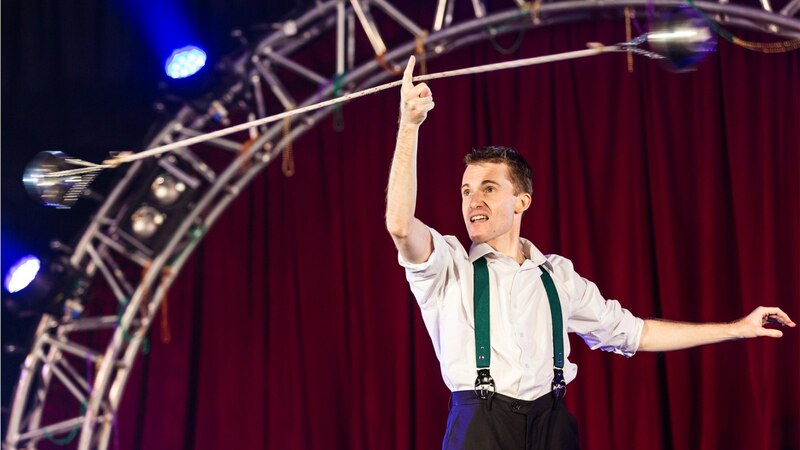 A ground act can vary in size; from a simple juggler meeting and greeting your patrons, to acrobats and a German wheel on a 10 x 10 metre stage. What to use ground based circus acts for? 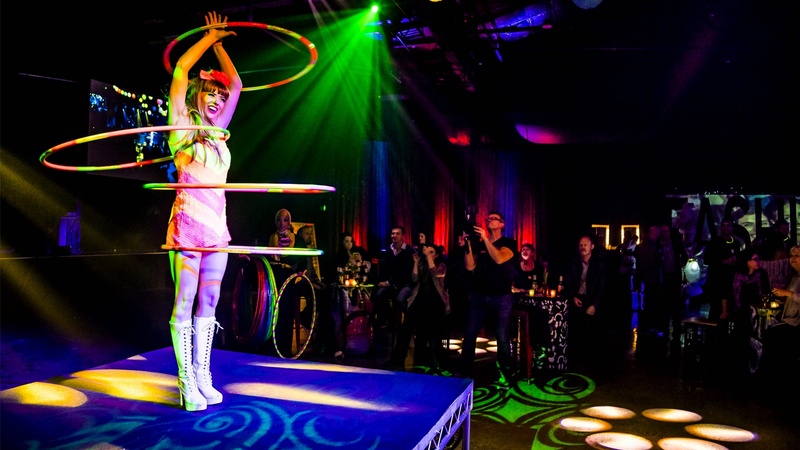 These kind of circus acts include Hula Hoop artists, Jugglers, Magicians, Uni-cyclists, Acrobats, Fire Twirlers, Handstand artists, Dancers, Comedians and Side-Show Artists. These artists are suited to be utilised as featured entertainment to make your event unique, or as roving entertainment to introduce and entertain your patrons during your event. Generally, a ground based circus act that is high impact like acrobatics, contortion or hula hoops usually lasts between 4-6 minutes. Low impact acts such fire twirling or a comedian may last a little longer, As a general rule though, most acts won't last longer than 10 minutes unless the artists tailor make a customised performance or show for you. If you are looking for a 10-25 minute segment of entertainment to fit in-between formalities, contact us and we can customise an option to suit you and your budget. Roving entertainment involves an artists interacting and performing to small groups of patrons, usually during the opening of your event, or as light entertainment in breaks of formalities. These are not full acts, more like walk-by entertainment where the artists 'roam' or 'rove' around the room. in most cases, this is an add-on form of entertainment that would compliment a featured stage act or to help immerse your patrons into your theme and world. Roving artists are usually booked for an hour interval, broken down as either 3 x 10 minute, 2 x 20 minute slots or 1 x 45 minute slots within the hour. You can book most roving artists for greater than an hour and a maximum of 3 hours. Aerial Silk - Kate N.
Silks, Juggling, ariel , Hula Hoops, etc. ​This a​rtist has been a ​​part of. ​Add information here about you as a performer. ​Your spiel, bio etc. Make sure this is still a sale piece and not too long. Lighting design, Set design and construction, stage management, production management and overall production design. 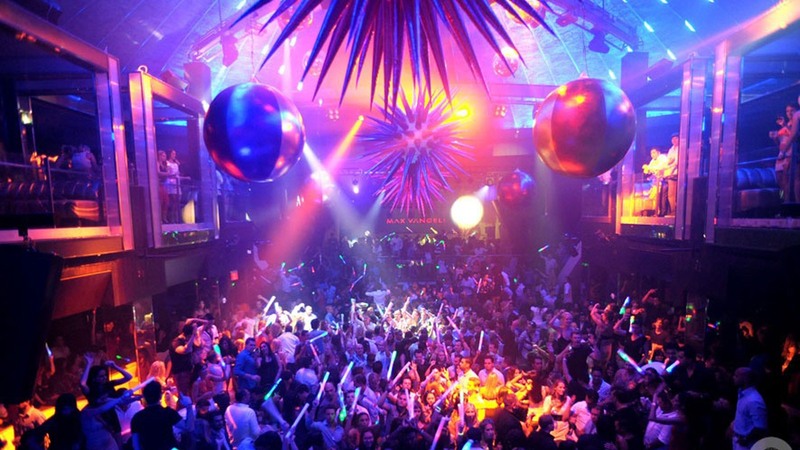 After Dark Theatre has a full design team that is able to create and compliment your vision. If you are tasked with the complex role of event design, theme and concept creation, we can help. After Dark Theatre's team has won a string of awards for lighting design and has been involved in the design of many award winning circus, theatre, musical theatre and dance productions. We have experience in small productions, high school musicals to large scale productions with complex intelligent lighting rigs. Our thorough pre-production ensures a smooth presentation of your show. Within our production design services, we can provide full touring specs for your production to allow for a smoother bump-in time frame; allowing you as the tour manager or producer to allocate more time to other touring logistics and the performance itself. With a extensive amount of tours in our portfolio, After Dark is experienced in providing detailed tech specification suited to you tour, budget and show. With our full 3D render suite, you can visualise everything without having to spend thousands of dollars on hiring a venue and equipment to visualise your artistic vision. the rendering suite also allows the programming of more advanced performances that would otherwise be impossible due to budget and time considerations in the theatre. The benefits of a fully professional LX design, without breaking the bank. Catering to a large demographic of clients, After Dark has a range of options for designs. This includes straight 'buy outs' and royalty based designs with lower initial fees to ease the financial burden on a new and upcoming production. 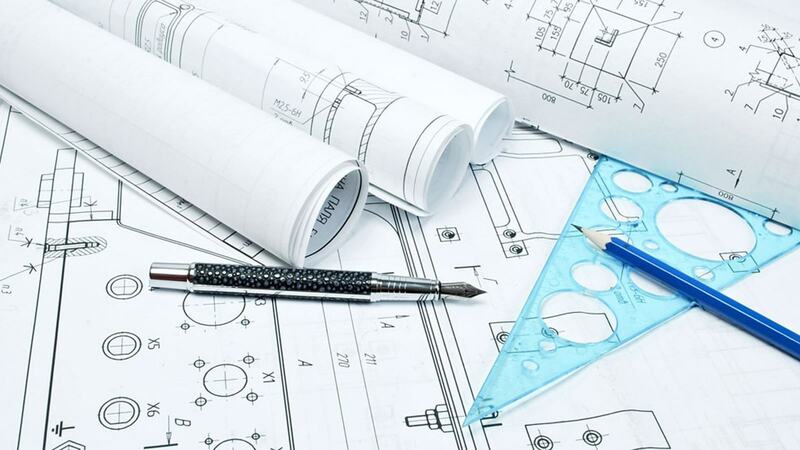 With all our designs, we offer full technical support to ensure your project's quality is never compromised. We know your event is special and in most cases, once off. The pressure is on to create a particular mood or feel and this can turn what should be a fun, creative role to a daunting experience. After Dark is here to help! We can generate the perfect feel for your event to match your production design. If you are a venue and are looking at buying new lighting products, or a festival hub site and need to organise designs to send out to multiple producers, then you'll need your venue drawn up in CAD or 3D rendering. After Dark Theatre's design team are adept in working with Lighting visualisation software, Photoshop and Sketch up Pro to create your venue. This is useful for organising seating arrangements, testing lighting rigs, logistically planning how many patrons your venue can hold, as well as being a powerful document and file for you to send off to potential clients if your venue is for hire. A festival site that sees your venue in full 3D are more likely to book your venue over another venue with lacklustre paperwork. You don't have to be a venue owner to get a Venue drawn up. If you are touring a production or have minimal information about a venue, we can create a 3D model for you to visualise how you can work in the space. Contact us to discuss your project in greater detail. Every event or function needs a little something to make it stand out. A clever way to make your event differ from others is to introduce a theme. This is where we can help. Our team are able to create a unique concept, bespoke event or themed function so your clients and patrons are entertained throughout the night. This service can contain: tailor-made entertainment packages, a custom show, room renders to visualise your theme, music and live entertainment to match your vision and much more. Not sure what theme you are wanting? Leave it to the design experts. Creating unique productions and themes is what we excel at. We can work out a suitable theme for your clientele demographic, customise a performance to make it memorable, design your colour-scheme and aid you in the operation and execution of your event. There is no event too big or too small; from a side room at a bar or club, to a themed gala night in a major function space; we are able and happy to help. If you want to browse some of our themed event ideas, please click here. If you prefer moving image projected to surfaces or something to compliment a DJ to your event, then why not utilise our AV and V-jay services? 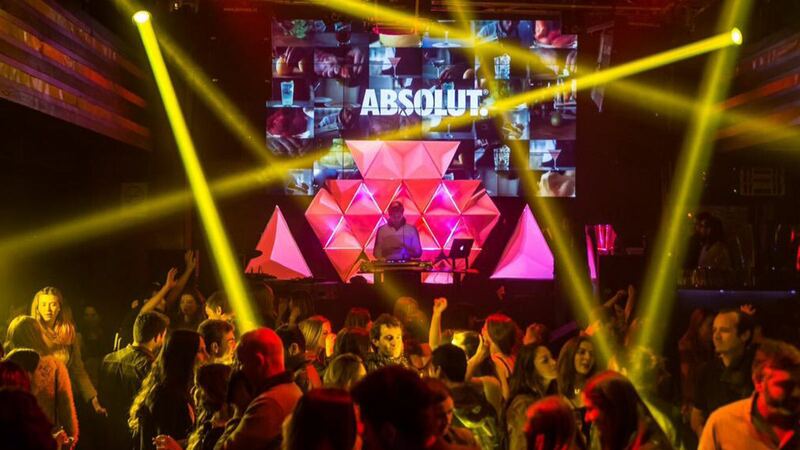 After Dark Theatre is able to design and operate high impact visuals to compliment your event. This form of passive entertainment is designed to engage your audience or to immerse them into your event. It is also a great compliment to a DJ or the dance bracket of your evening. Like what you see or need to talk your idea out with one of our event and design consultants? Contact us. Copyright text 2016 by Anthony Sharpe.